were highly motivated because we needed at least two brimming cups of blueberries to make one of my mother's delectable blueberry pies. As every discerning person knows, a wild blueberry pie is the closest thing in this world to the food of the gods. Those Kushog blueberries were unsurpassed. As I said, it may be my imagination but I think that it would be much harder to fill those cups and tin pails with Haliburton blueberries nowadays. We continued renting Rogers' cottages through the war. Our dad would drive us up from Toronto at the beginning of July. 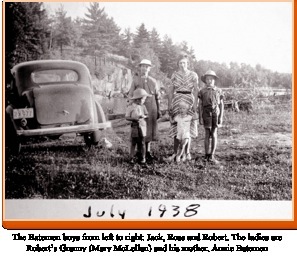 We three Bateman boys would be lying on the bedding in the back which somewhat cushioned the jarring ride over the narrow, dirt, pot-holed road through Haliburton county. We would get the woodstove fired up and the coal oil lamps lit, and maybe Mom or Grandma would read us a story. The next day, after getting ice from the sawdust in the ice-house attached to Rogers' barn, Dad would drive back to Toronto. We would be car-less for two weeks, then Dad would come up again for his holiday. We were fine for provisions. The farm provided milk, eggs and chicken as well as vegetables. Drinking water came from the farm pump, carried by us in buckets, a 10-15 minute "trudge" away. The sound of a motor was a rarity in those days ... few outboard motors and of course no lawnmowers or chainsaws. Almost the only manmade sound would be the squeak of oarlocks as the occasional intrepid cottager would row to Carnarvon via Little Boshkung and Twelve Mile Lake to get the mail or some groceries. When our dad came back up to the cottage we would always look forward to the great adventure of rowing up Boshkung to the foot of Buck Slides and walking up the portage trail to have a picnic on the flat, sloping rocks below the roaring white rapids. Lake Kushog was in the remote and mysterious hinterland beyond. And if the season was right, we would drive around the daunting road to harvest the bounty of the Kushog rocks ... the succulent blueberries.